These cupcakes are super delicious and beautiful. Baked by Rubina Amjad. 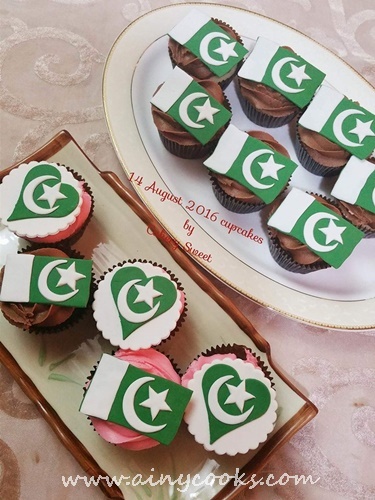 The way she decorated them with Pakistani FLAG inspired me a lot. She is running her online bakery you can visit her page, Cakery Sweet. Her recipe was selected in Top five recipes in Vim foodie contest. 2. Sieve Flour,baking soda,baking powder and salt. 3. Mix cocoa in warm water. 4. Beat butter and sugar till creamy, add egg one by one and beat well. You can add vanilla essence if you do not like egg smell. 5. Add flour mixture alternating with cocoa warm water mixture, mix on low speed. 6. Arrange cupcake cases in muffin tin and pour batter in it. 7.Bake at 180c for 15 minutes or till done. 8.Let them cool down and prepare icing. 1.Beat butter, vanilla and salt. Add icing sugar and beat well. 2.Add cocoa powder and milk 1 tbsp, beat again. You can add 3-4 tbsp milk but depends of consistancy of butter cream. Do not add 4-5 tbsp at a time add with intervals. 3. Fill butter cream in piping bag and use 1 M nozzle to decorate cupcakes. 4. 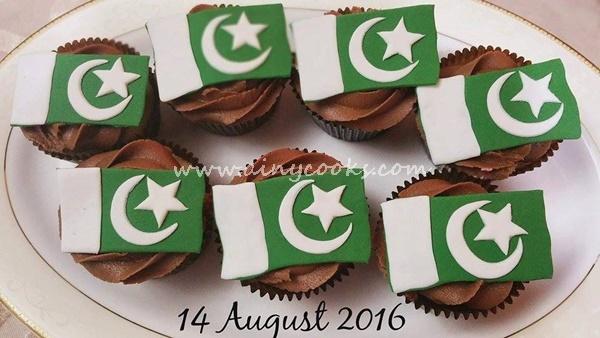 Make flags with fondant and decorate cupcakes.